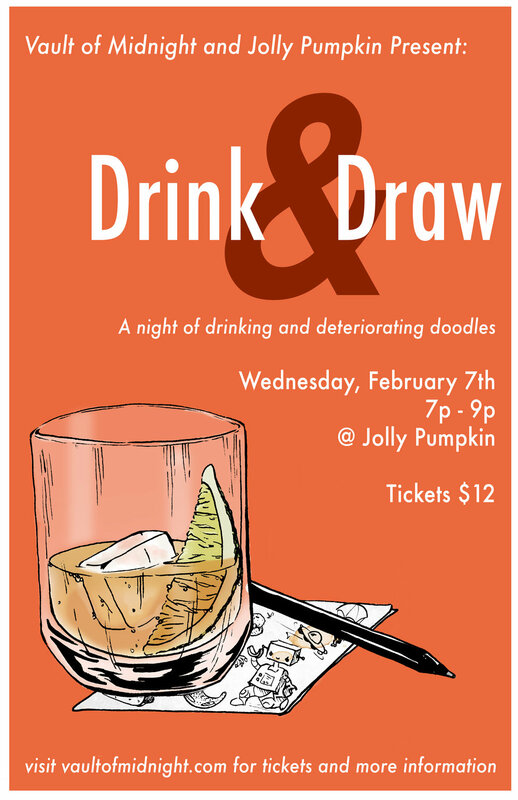 Calling all bar-napkin savants, web-comic-ers, dabblers, dawdlers, and doodlers! Have you ever wanted to spend an evening meeting local creatives, exchanging ideas, and swapping techniques over a cold pint? You know you have. C'mon! Coming your way this February is an event to unite Ann Arbor artists of all calibers, for drinking, drawing and over-all merriment (and not necessarily in that order). Your ticket is also good for one beverage during the event! Copy paper, pens, pencils, and drawing prompts will be provided, but why stop there? Feel free to bring your own markers, pens, colored pencils, watercolors - whatever your little heart desires, really! We invite you to join us for a night of great company, conversation and collaboration hosted by Vault of Midnight and Jolly Pumpkin.